The explosion of the Fukushima reactor in 2011 prompted many nations to abandon nuclear power and turn to fossil fuels to meet their energy requirements. On March 11 of this year, Japan marked the third anniversary of the tragic earthquake and tsunami that killed more than 18,000 people and ultimately led to a global push away from nuclear power. As predicted a year after the Fukushima disaster, concerns about the dangers of nuclear power are laying the foundation for runaway climate change. The tsunami that hit Japan’s Fukushima Daiichi nuclear complex on March 11, 2011, shut down power and led to a meltdown. On April 20th 2011, the government of Japan declared a 20 kms evacuation zone around the disabled reactor and almost three hundred thousand people were displaced. A chronological review of events reveals a clear causal connection between the explosion of the Fukushima reactor and an increase in Japan’s carbon emissions. Prior to the March 11 tsunami, nuclear energy provided one third of Japan’s power. Then after the incident, the country’s atomic reactors were powered down. On April 19th and 20th, 2012, the four Fukushima reactors were decommissioned. In May 2012, Japan’s prime minister, Naoto Kan, announced that the government was putting the brakes on its planned expansion of nuclear power. One and a half years later (November, 2013), the government of Japan announced a very significant increase in its carbon emissions. In 2009, Japan pledged to cut its carbon emissions by 25 percent based on 1990 levels within 11 years. Now Japan says that their emissions are expected to rise by 3.1 percent by 2020. 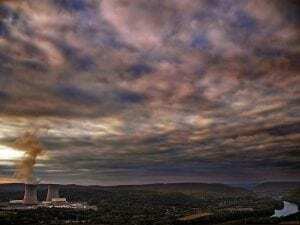 This is due to the use of fossil fuels to provide power in the wake of the closure of the nation’s nuclear power plants. As the world’s fifth largest CO2 emitter (responsible for around 3-4 percent of global CO2 emissions), Japan has gone from being a leader in carbon reduction to being a carbon producing disgrace. The meltdown has been undeniably costly, with tens of billion of dollars going towards cleanup and compensation. However, this is but a small fraction of the costs the island nation will incur as the world warms and sea levels rise. Germany has also decided to phase out nuclear power. Shortly after the Fukushima disaster, the Merkel government immediately shut down 8 nuclear plants and decided to shut down all of the nation’s atomic power capacity by 2022. To make up for the energy shortfall, Germany has built a number of coal power plants. The net result is that in 2013, Germany’s use of coal reached a 20-year high. This situation is destined to get worse as the country has more than 10 GW of new coal fired power stations scheduled to come online before 2015. This amounts to more new coal capacity than was constructed in the entire two decades after the fall of the Berlin Wall. The annual electricity production from coal will cancel out the combined energy output of all of Germany’s solar and wind power. The German decision to end nuclear power will contribute an additional 40 million tonnes of carbon dioxide into the atmosphere by 2022. Producing electricity with fossil fuels emits vast quantities of carbon into the atmosphere. To produce the same amount of electricity as produced in an average nuclear plant in one year, a natural gas plant (the cleanest burning fossil fuel), will emit roughly 3 million tonnes of CO2, or 900.000 tonnes carbon equivalent (these figures do not factor the vast quantities of greenhouse gases that leach into the atmosphere during extraction, refining and shipping). To put it simply, substituting just one nuclear reactor for natural gas turbines generates emissions equivalent to a city of 400.000 inhabitants. If we use coal to generate electricity, the net result is twice as bad as that of gas. That means at least 6 million tonnes of CO2, or a minimum of 1800.000 tonnes carbon equivalent. Using coal in place of just one atomic reactor would generate emissions equivalent to a city of more than 800,000 people. To see the data upon which these figures are based, click here. In a perfect world, our power will be drawn entirely from renewable sources of energy. However, it should be obvious that we do not live in a perfect world and each option comes with its own risks and rewards. We are called by future generations to make some hard choices about energy generation. There is no avoiding the fact that we will not be able to reduce climate change causing emissions by increasing our reliance on fossil fuels. While renewable energy is clearly superior to nuclear, it will take time to scale it to a size where it can meet the demand. It would be impudent to say that concerns associated with atomic power are entirely unfounded. However, with the appropriate safeguards, nuclear can be a responsible part of our energy mix that serves as a bridge to a future powered by renewable energy. As the rest of the world abandons nuclear energy in droves, to its credit, the U.S. continues to see value in atomic energy. The U.S. is leading the way by extending the lives of its nuclear power plants while ensuring that they are safe. As Europe plans to decommission almost 150 nuclear power plants by 2030, the U.S. has extended the life of 71 and chosen to close only five. Our current carbon trajectory is unsustainable. We have been steadily increasing the amount of carbon at an average annual rate is 2.1 parts per million (ppm) per year. We have now exceeded 400 ppm of carbon in the atmosphere. If we continue to burn fossil fuels, this untenable trend will only continue. We need to step outside the hysterical fray of voices calling for an end to atomic energy and weigh these concerns against the implications of runaway climate change. A cooler assessment reveals that a world ravaged by global warming is far more catastrophic than even the worst outcomes of nuclear power. Abandoning nuclear energy for fossil fuels is kind of like jumping out of the pot and into the fire.